A rendering of the Energia rocket launching its primary payload, Buran. Unlike the American shuttle stack, the rocket could be launched on its own, and was in the same class as the Saturn V. Image source and copyright status unknown. Please contact the author if you know of its origins. Click for a larger view. What it was: A Soviet super-heavy lift launcher. It was one of the three most powerful rockets ever built, in the same class as the Saturn V as well as the ill-fated N1 it was partially intended to replace. Its other main role was to act as a booster for the Soviet space shuttle, unlike the American one which got itself to space using its own engines fed by its large external fuel tank. Though it did go to space twice in 1987-88 it qualifies for this blog because it didn’t fly any more after that, despite being intended as the heavy-lift backbone of the Soviet Union for well into the 21st century. Details: For about twenty months after taking over TsKBEM (the former OKB-1) from the disgraced Vasili Mishin, Valentin Glushko worked toward a lunar base centred on a derivative of the Proton rocket, a design of Vladimir Chelomei’s using hypergolic engines designed by Glushko. By early 1976, however, Glushko had been told by Soviet leadership to stop work leading to the Moon and instead focus on a Soviet space shuttle in response to what they perceived as the military threat posed by the US’ own Space Shuttle. While the eventual Buran shuttle would bear a strong resemblance to the American orbiters, Glushko made one major change that let him keep his Moon base alive surreptitiously. In the American Space Shuttle, two strap-on boosters helped pushed the shuttle stack to 46 kilometers high. But some of the thrust up to that level, and all of it from the moment of booster separation, came from engines on the aft end of the Shuttle. In other words, the Shuttle was at least partly its own launch vehicle, while the external tank to which it was attached was not in any way a rocket. It existed solely to carry fuel for the Space Shuttle’s main engines. Glushko chose instead to build Buran with no engines at all. 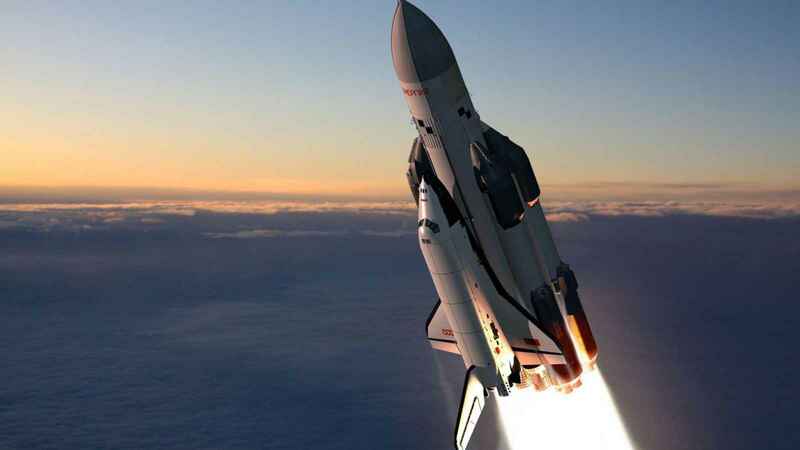 It was solely a glider for returning to Earth, while it was lifted into orbit by engines on the end of what superficially appeared to be a copy of the US Shuttle’s external fuel tank—but was actually the Energia rocket. In other words, the Soviet Union’s chief designer hid a Saturn V-class booster, potentially useful for his beloved Moon base, in his space shuttle system. Energia began when Glushko took over TsKBM (in fact the name “Energia” was applied to the newly reorganized department as NPO Energiya long before it was given to the rocket) and brought with him his new RLA (“Rocket Flight Apparatus” in Russian) rocket designs. In the early 1970s the Soviet Union had no less than three active launchers, discounting the N1—R-7 derivatives, the Tsyklon, and the Proton. All three were different from one another in design and construction, and the cost of running them were accordingly high. For the third generation of Soviet launch vehicles the requirement was to build light, medium, heavy, and super-heavy launchers from one common set of components, and the RLA was Glushko’s proposal to meet this. Of the various designs, the super-heavy RLA-135 is the one that interests us. The RLA series was passed over in favour of the Zenit rockets of the Yangel Design Bureau but Yangel didn’t have a super-heavy solution, stopping instead at the “medium” level and leaving an opening for Energia. Glushko took his RLA-135 design, which had a large core rocket and strap-on boosters, and proposed it again with a modular version of the Zenit as the boosters and the core being a new rocket designed by his bureau. His suggestion was accepted and the Energia was born. Glushko did have to take one other hit to his ego, though. For years the Soviet space program had been hampered by the fact that he refused to go along with Sergei Korolev’s judgment that LOX and liquid hydrogen were the best fuels to use on a large rocket. The N1 accordingly had engines built by a far less experienced designer, Nikolai Kuznetsov, while Glushko focused on nitric acid and dimethylhydazine. But while those propellants have the advantage of being dense and storable, they’re also not as powerful by weight and have the disadvantage of being a toxic disaster to clean up if a rocket fails. Furthermore, the Soviet leadership were interested in catching up with the United States in LOX/LH2 engines—the USSR had never built a large one, while the second and third stages of the Saturn V used them, as would the Space Shuttle Main Engine. Partly of his own accord but also because of this political pressure, Glushko had to concede in his ongoing argument with the eight-years-dead Korolev. That said, he pulled it off. Over the course of the next ten years (which is long, but not too long: the Saturn V took a bit less than seven years from proposal to first launch) NPO Energiya developed the massive core stage of the rocket. The side boosters were relatively easier, being smaller and using the kind of LOX/kerosene engines that the USSR had plenty of experience with, so the entire rocket stack was ready to fly for the first time by October of 1986. Unfortunately they didn’t have a payload for it. While there had been some problems developing the Energia, the Buran shuttle was having a far worse time of it and wasn’t anywhere near completion. Up to this point the name “Energia” had been applied to both the booster and the spaceplane taken together, but Glushko’s earlier misdirection came back to the forefront. The rocket didn’t need to wait until its other half was ready. As it entered its last year of development, the decision was made to launch it first without Buran. Between the fall of 1985 and fall of 1986, a new payload was quickly whipped up named Polyus. It was one of Vladimir Chelomei’s Functional Cargo Blocks, repurposed from a space station module and closely related to the Zarya module of the ISS. Polyus carried a wide variety of experiments, but its main purpose was to test the Skif-DM, a 1-megawatt carbon dioxide gas laser weapon that the USSR had been working on since 1983. Retrospectively this is less alarming than it seems, as the USSR had been hammering the US over the Strategic Defense Initiative and Mikhail Gorbachev was less than keen to risk the Americans finding out that his country was countering militarily; the Reykjavik Summit had ended in October 1986 with the two countries close to radical nuclear weapons reductions, and they would conclude the INF treaty in December of 1987. Various components of the laser were deliberately left out, leaving it with only the ability to track targets, and Gorbachev is reported to have banned testing of even that during a visit to Baikonur a few days before launch. From the standpoint of the rocket, however, Gorbachev’s visit is most interesting as it led finally to the formal naming of the launcher (as distinct from the shuttle it was supposed to launch) as Energia: it was painted on its side just prior to his tour. The General Secretary’s misgivings notwithstanding, the first launch of Energia went ahead on May 15, 1987. During the first few seconds of its flight, before it cleared the launch tower, it tilted noticeably to one side but then corrected itself when the rocket’s attitude control system kicked in at T+3 seconds. From then Energia flew beautifully, watched only by a sole Soviet MiG as from the standpoint of the ground it quickly disappeared in low-hanging cloud. Its boosters were seen to separate correctly (though for this flight and the next they were not fitted with the parachutes that would make them recoverable), and then the core stage flew out of range of even the jet watching it. Upon burning out, it released Polyus and re-entered into the Pacific Ocean, as planned. Polyus weighed 80 tons, and so to reach its useful orbit it had to fire a small rocket engine of its own after being released. To do so it had to rotate 180 degrees, and unfortunately for it a programming error made it continue to rotate as the engine fired—deorbiting it instead of pushing it higher. It too crashed in the Pacific. While this was an embarrassing result, the rocket itself was a complete success. Work continued on Buran and the largely completed shuttle (while flyable, at the time it could generate only enough power for one day in orbit) was mated to another Energia and launched on an unmanned mission on November 15, 1988. Again, the rocket performed admirably (with a change in its own programming to prevent the alarming blast-off tilt) and this time its payload did too: Buran landed automatically at Baikonur after two orbits, three hours and twenty-five minutes later. So by the beginning of 1989 the Soviet Union had itself what was at the time the most powerful rocket in production, and one that hasn’t been approached closely ever since. It could launch a space shuttle with a payload similar to that of the US’ orbiters, and if used as a rocket on its own could lift 88 tonnes into low Earth orbit or 32 tonnes to the Moon (compare to 118 and 45 for the Saturn V, and 92.7 and 23.5 for the N1 it replaced). Further development was expected to push this to 100 tonnes, and work moved forward to build a dedicated cargo pod rather than the cobbled-together Polyus to lift. A smaller version of the rocket dubbed the Energia-M, with one engine and two boosters, was underway too so that smaller payloads up to 34 tonnes could be lifted more cheaply. What happened to make it fail: Clearly the collapse of the Soviet Union was the major cause. Just as the launcher was finding its legs the security concerns of being a superpower evaporated, as did money for any large-scale scientific missions it could have supported. There was also the problem that the Zenit-derived strap-on boosters were built by a company that was now in the independent Ukraine. Even before that, though, Energia was already suffering from a lack of missions—if you’re not going to the Moon, lifting 100 tonnes to orbit is a bit superfluous. The shuttles it was primarily designed to lift had the same flaws as the American shuttle, and didn’t have the advantage of being the country’s sole launcher of note (as the US Shuttle did prior to the Challenger explosion in 1986). Orbiting massive lasers to deconstruct oxygen in the upper atmosphere, for the purpose of rebuilding the ozone layer over the course of several decades. Using it to build a Helium-3 mining base on the Moon—bearing in mind that Helium-3 is only useful in fusion power plants being developed by an international consortium that believes they’ll be ready to go in 2050. Launching spent nuclear fuel waste into “graveyard” heliocentric orbits. Ultimately it came down to a question of what it was supposed to do that couldn’t be done by smaller, cheaper rockets—each launch of an Energia cost $US240 million, even at the more favourable black market rate of the rouble to dollar in the late 80s. Even if launches were reserved for situations where only it was capable enough, just keeping the plant in place to build it would have cost a not-so-small fortune, which the Soviet Union didn’t have and post-1991 Russia most definitely didn’t have. What was necessary to succeed: Keep the Soviet Union a going concern. This is difficult if one subscribes to the theory that the Soviet Union collapsed primarily because of financial pressures, because you can also reasonably say that Energiya/Buran was one of the main straws breaking the camel’s back. It was representative of the unchecked spending that killed the USSR and if the only way they could have continued would have been to not do this sort of thing. On the other hand, one can reasonably argue that it was Mikhail Gorbachev’s reaction to the country’s finances that did the worst damage, and that the USSR could have limped along into the present day if the Politburo had come up with someone other than Gorbachev as leader following Konstantin Chernenko. That solves the major problem with a large booster—that it’s not economically feasible to run one for anything other than special purpose missions. The Soviet leadership got the USSR into financial trouble by ignoring costs when it suited them, so Energia probably would have flown every now and then until the belated collapse of this postulated Soviet Union did finally occur. Putting aside the more radical missions mentioned above, what would Energia been used for? Likeliest would be a space station built around one or more large modules, with other smaller ones being lifted by the Energia-Buran combination. Mir-2 was redesigned to be built solely from 30-ton modules as late as 1991. Also possible was a smaller shuttle, OK-M2, which would have perched on top of the Energia stack rather than on the side. If the USSR’s leaders had reached the same conclusion about their space shuttle as many people did about the American one, it’s entirely possible they would have scrapped Buran and its follow-up orbiters, flown Energia as a cargo rocket for a while, and developed this smaller proposed shuttle as a replacement. Glushko’s bet that the Soviet space program would go through a future shake-up, as it had several times before, was probably a good one too. While it’s obviously more efficient to design a launcher around proposed missions, past history shows that once a system is designed people start figuring out ways to use it. With a super-heavy launcher at hand, it seems likely that the Soviet Union would have eventually got around to a Moon landing, and only somewhat less likely that they’d have moved on to a Moon base. It really would have come down to a race between deteriorating Soviet finances (assuming that they couldn’t have come up with a softer landing at some later point than actually happened ) and the time when someone with power in the Politburo and Secretariat came to champion it. It would have been expensive and somewhat pointless, but that was the USSR’s modus operandi in any number of megaprojects. As it happened, Glushko died on January 10, 1989, less than two months after the Energia’s second, and last, flight, and before his bet had a chance to pay off. Though none of this ever came to pass, Energiya does have a continuing legacy down to the present day. The Zenit rocket that shares so much technology with the Energia’s strap-on boosters became the cheapest of all current launchers (at about US$2500 to $3600 per kilogram). In 2010 NPO Energiya bought out its partners in the Sea Launch consortium that uses them, and is now in charge of firing them from their ocean platform as well as from Baikonur in Kazakhstan. The RD-170 engine developed for the Zenit and the Energia strap-ons have also proven to be one of the best rocket engines ever developed. Its derivatives are still used on the Zenit, on a South Korean rocket called the Naro-1, the upcoming Russian Angara rocket family, and surprisingly even on the American Atlas V, which not only launched scientific missions like the Curiosity rover and the New Horizons probe to Pluto but also is used by the US military. Such is the difference between 1988 and the present day. YouTube video of the first Energia launch, including its alarming tilt away from the launch tower before its attitude control system kicked in, can be seen here. This entry was posted in Post-Apollo to the Present Day and tagged buran shuttle, manned space programs, militarization of space, reached flight status, rocket, soviet space shuttle, space shuttle, spaceplane, ussr, valentin glushko by Paul Drye. Bookmark the permalink. Considered from outside, what Energiya looks best for is space-station components and lunar base components. I think that to justify its ongoing use (in the hypothetical non-collapsed USSR) at least one of those projects needs to be a going concern. Which, sadly, probably means that the Americans need to be doing the same for the Soviets to compete against. The Soviet Union was big on space stations regardless of whether or not the US was doing it. They had Salyuts 6 and 7 (which were proper lead-ins to Mir) up and running before Freedom was proposed, and even Mir itself was spec’ed out and ready to go by early 1984 — only to be held up, ironically, by Buran. So I think it’s pretty safe to say that Energiya would have been involved in Mir-2, and possibly even in the last bits of Mir (which were added from 1995-96 in the real world). Certainly the original designs of Mir-2 had a 90 tonne module as its backbone, and that wasn’t going up on a Proton. The moon base is more conjectural, but it’s not hard to picture Glushko’s thinking (he wrote memoirs, but back before it was a good idea to be candid). The Soviet space program had already undergone two major shake-ups and reorientation, once in 1964-65 and again in 1976. Both were driven by changes in the Politburo and the relative political strength of the military. Another one, eventually, seemed likely, and there were only so many major goals the space program could aim for — why not assume that an emphasis on the Moon would return, one day? A race with the US would help a lot — they’d helped generate the last two shakeups — but wasn’t the be-all and end-all of Soviet space policy. The story is that Gorbachev, who hadn’t been in power for long when Energia was set to launch Polyus, was aghast when he learned of it. He was, after all, trying to turn down the Cold War, not antagonize the West, so that he could spend less on weapons and his economic reforms could have a chance. What I have heard is that Gorby was convinced to allow Energia to fly with the Polyus payload – but the world had to be told that it was a test payload or a dummy payload not meant to attain orbit, and it had to be allowed to reenter over the Pacific. The aerospace establishment flew Energia/Polyus on that basis to prepare for Buran, but ultimately both Energia and Buran were judged to be too costly to operate and were shelved. As was often the case, the aerospace bureaus involved hung onto the hardware in case the political winds shifted, but Baikonur’s deterioration led to the destruction of the flown Buran. Energia was assumed to be available in US planning until about 1999, though by then it was almost certainly too late to use more than subsystems. I just don’t get it. It’s a beautiful machine. They should have used it to go to the moon. Can you imagine what China would give to have the technology to make something like this.